Primordial Sound Meditation, the Chopra Center’s meditation program developed by Dr. Deepak Chopra, is presently offered in a small (2-3 people) group as a one-day retreat, as private one-on-one sessions for your convenience (live or virtual) or in a larger group over 2 days. A Self-Mastery practice, Primordial Sound Meditation is a tool for rediscovering the body’s own inner intelligence, and a journey to emotional freedom. It’s not about forcing the mind to be quiet; it’s finding the silence and experiencing the deep inner calm and the deepest sense of spiritual connection that’s already there. A daily meditation practice can help you to awaken intuition, improve sleep, reduce anxiety, become less reactive and judgmental, maintain higher vibration, and enhance brain-wave coherence. 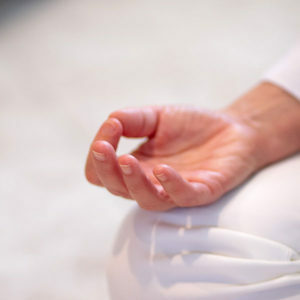 Beginners and experienced meditators who wish to deepen their practice are welcome. This Mantra Meditation is easily learned in 4 short sessions. Session 1 Learn the basic principles of meditation, its history and the importance of your mantra. Session 2 In a private traditional ceremony, receive personal instruction in your mantra and experience your first meditation. Session 3 Learn the practical aspects of meditation, how to blend your practice into your existing daily life, share your experience, receive answers to any questions, and participate in a group meditation. Inquire how to receive discounts to Chopra Center programs. Includes your personal mantra, and the Guidelines for New Meditators workbook by Drs. Deepak Chopra and David Simon. Inquire about children and teen rates. Please refrain from perfumes or colognes. Loose comfortable clothing recommended.